View Tameson’s range of pneumatically controlled 3-way ball valves, which are used to control the flow of liquids and gases remotely. The actuator will open and close the ball valve with compressed air (single acting uses a spring to either open or close the valve). The ball valve has a hole through one side to allow flow when turned appropriately. 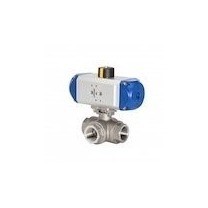 These valves are 3-way valves (3 ports) and offer good sealing properties. Available with L-bore or T-bore. Pneumatic actuators are a reliable solution and often used to control larger valves than electric actuators at a lower investment cost. There are various housings, seals, and sizes of pneumatically controlled ball valves to allow you to find the right one for your application.